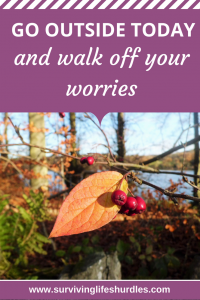 Sadly getting a bit of fresh air and going for a walk won’t magically make your problems disappear but if you’re anything like me you will find your worries and negative thoughts become a lot easier to manage just by completing a simple outdoors task. I’ve had a lot to worry about this last year or so and in my worst moments I never thought I’d be able to manage my problems as well as I am doing today. In fact it’s amazing how much my wellbeing has improved since I started walking regularly just a few months ago. Back then I was in a really bad place with my health after suffering from another MS relapse and my anxiety over the prospect of losing my job and the impact this would have on us financially meant that I was only achieving an hour or two of sleep most nights. In a desperate effort to help me sleep better, I remembered reading that exercise could help. Between my lack of sleep and physical disabilities I knew that it would be hard and I needed to start off small so I dragged myself outside and managed to walk up the street by my house and back again- I must have been walking for a grand total of 10 minutes but it felt like I’d run a marathon (or how I imagine a fit and healthy person would feel after running a marathon)! Although I wasn’t looking forward to it, the next day I did the same again. I didn’t push myself to go further, I just did the same. I think this was an important step because how often do we think ‘I did that much yesterday so I can do a bit more today’ but in reality just because we managed something yesterday doesn’t mean that we are actually capable of doing any more straight away and we end up setting ourselves up to fail? A few days later and the dread of going on my walk had disappeared only to be replaced by an unexpected enthusiasm- it was grey, miserable and raining but I was starting to really look forward to my daily walks. All because walking was really helping to decrease my anxiety levels. 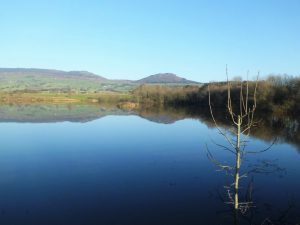 If I was stuck at home feeling like my problems were swallowing me up, once I took a few steps outside, getting a bit of fresh air made me instantly calmer and gave me a bit of much-needed headspace. I was starting to notice a slight improvement in my sleep and my fatigue didn’t feel quite so bad, also I felt better in myself for having accomplished something which I found so hard. I gradually started to increase how far I was walking but if I was having a bad day and couldn’t go as far I just did two much smaller walks spread out across the day. By the end of my first month I was walking for around 20 minutes a day (not far for most people but for me a massive achievement at double what I started off at)! At this point I had started to share my success with my friends and family and some of them in their desire to help suggested other exercises I could try as well, such as swimming and yoga. I thanked them for their suggestions and told them that although there would (hopefully) be a time when I could take on more activities, that pacing myself with walking was something that I believed was working for me and I didn’t want to mess that up by taking on too much too soon; small changes and establishing something fully before introducing anything new seemed to be working well and I didn’t want to jeopardise my progress. A few months down the line and every day I go for a walk and I can now walk further than I have in a long time. Walking and being outdoors has brought so much more to my life than I ever anticipated. My anxiety levels are generally much lower and I know if I feel them creeping up again I can go for a walk! 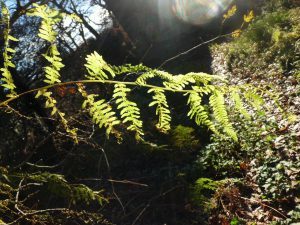 If my thoughts are a muddle walking helps to provide clarity and I start to see things differently or feel inspired; I don’t think I would’ve been able to realise this blog without being able to structure my thoughts so clearly through walking. I also sleep well now most nights and feel happier within myself. I still have the same problems mostly but now have more tools to manage and deal with them better. 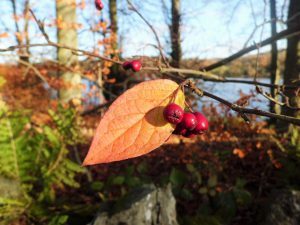 Going for a walk outside is also a fun activity I can enjoy with my toddler and I love photographing the beautiful sights around us; all of the photographs included in this blog post were taken on a variety of walks with a basic point and shoot camera in the local area. Walking has helped to inspire me and encouraged me to re-connect creatively with the world around me- what isn’t to love about that? Especially as creativity and self-expression are so important to our wellbeing, anything which helps to fuel our ideas and imagination is definitely a good thing! I know everyone’s circumstances are different, if you are capable of getting outside and exercising more, then do more. If you can’t do so much, then do less but the important thing is that you don’t let your hurdles stop you and you do what you can, whatever that may be, in small steps. You will probably surprise yourself with what an impact this has on your life! Most importantly- let me know how you get on- I’m rooting for you! Do you already have you own experiences of managing your worries through going outdoors and taking regular exercise? I would love to hear how you approach this and what works for you. I love walking. We live a short drive from the peak District so we’re spoiled really! Must make time to do more. The Peak District is beautiful and the perfect place for a walk, some of the views are amazing! Thanks Jodie. It can be really hard to get out for a walk, especially in winter. I must admit I’m really looking forward to the weather warming up a bit and longer days for some nice evening strolls!